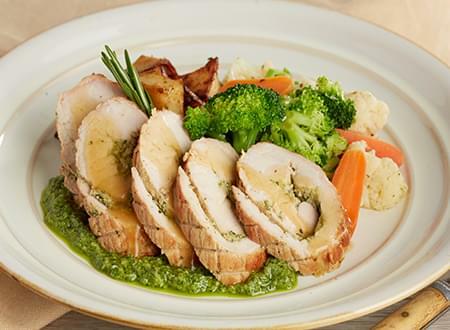 We start with the tenderloin of pork (filet mignon of pork) and wrap it around a puree of fresh parsley and sage, garlic and aged parmigiano cheese. Then we roast it to perfection and accompany it with a Natural pork gravy created from the roasted pan drippings. Pork loin, sage, parley, garlic, parmesan cheese, sunflower oil. (sauce) pork stock, carrots, onion, celery, garlic, thyme, wate,r maize ultra sperse.